An award-winning clarinetist and an internationally recognized opera star will present free masterclasses at Loyola University New Orleans this spring. Jose Franch-Ballester will present a clarinet masterclass Saturday, Feb. 23 at 12 p.m. in Room 240. Loyola alumnus and bass baritone Greer Grimsley ’76 will give an opera masterclass Friday, March 1 at 4:30 p.m. in Room 230. Both events are free, open to the public and take place in the Communications/Music Complex on Loyola’s main campus. A native of Moncofa, Spain, Franch-Ballester is heralded as one of the most promising clarinetists of his generation. In 2008, he received the highly coveted Avery Fisher Career Grant, and in 2007 he was one of a handful of participants selected for a Carnegie Hall Professional Training Workshop with Emmanuel Ax and Richard Stoltzman. A regular guest artist with internationally acclaimed artists and orchestras, Franch-Ballester is in demand at festivals throughout the world. He will perform Aaron Copland’s “Clarinet Concerto” with the Louisiana Philharmonic Orchestra at the First Baptist Church in New Orleans Feb. 21. With a career spanning three decades, Grimsley is a celebrated opera star and one of the most prominent Wagnerian singers today. A New Orleans native, he has sung leading roles with America’s premier opera companies, including the Metropolitan Opera, the Lyric Opera of Chicago, the San Francisco Opera and the Houston Grand Opera. 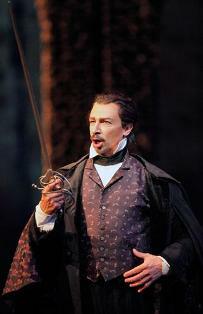 He has also performed on the stages of many prestigious European opera houses. Grimsley will perform the role of High Priest in the New Orleans Opera Association’s production of “Samson and Delilah” March 15 and 17. The Franch-Ballester masterclass is part of the Louisiana Philharmonic Orchestra Masterclass Series at Loyola, which in the fall featured Yo-Yo Ma on cello, Christopher Martin on trumpet and Jay Friedman on trombone. Violist Roberto Diaz will present a class in April. The series offers live webcasts of several of these events, all of which are free and open to the public. Loyola’s College of Music and Fine Arts has a vast music program, with more than 500 undergraduate majors in the School of Music and Department of Music Industry Studies. For more information, contact Jess Brown in Loyola’s Office of Public Affairs at 504-861-5882.